Finally! Election Day is here. Now what? Election Day has finally arrived after the torture of endless campaigning that seemed to last forever. Yet, that may be fitting, since the impact of our nation's collective votes could last forever as well. At the end of the day, the best news could be record numbers of voters showing up at the polls to do their civic duty. If only the outcome would bring more worshipers to church on Sunday, too, even if they arrived with heavy hearts. We've heard about the expected anxiety of our populace emerging from this election possibly more damaged, divided and desperate than ever before. So now what? Will your church try to offer healing, wholeness and hope to our fractured society? Will you offer prayer walks and services, special worship emphases, Holy Communion at your altar or out on street corners (Read " Communion on Election Day can make a statement"), community dinners with dialogues, compassionate outreach ministries, advocacy for justice and mercy, unity celebrations... In God's name, what will you do? If your church plans to do something special in a community on or after Election Day, please let us know. Why? So we can put lamps on lampstands to shine light into the darkness. Because the world needs to know our witness for such a time as this. Contact us at communications@epaumc.org. Meanwhile, check out the Rev. Susan Henry-Crowe's article " Voting: A Prayerful Act." "Voting is a matter of faith, citizenship and democracy" writes the General Secretary of our denomination's Board of Church & Society. "It is a kind of prayer and faithful testament to the belief that every citizen bears a responsibility and equal right to determine the future of governance in society." Two new employees, one temporary and one part-time, joined the Eastern PA Conference staff this week. The Rev. Mary Catherine Miller ( mcmiller@epaumc.org) is a District Transitional Consultant for the Central District, a new, temporary position that will end, along with the district itself, June 30, 2017. She will perform the duties of a District Resource Assistant but also other Central District responsibilities related to the conference's transition from six districts to four by July 1, 2017. Miller is an ordained elder in the conference, and a Transitional/Intentional Interim Minister Specialist. She is currently pursuing a D.Min degree in Transformational Leadership in the Wesleyan Perspective through Wesley Theological Seminary, in Washington, DC, in partnership with Wesley House in Cambridge, England. Diana Howard ( dhoward@epaumc.org) is our new part-time Support Associate in Accounting. She is a member of St. Matthew's UMC in Valley Forge and has an extensive background in accounting and computer troubleshooting. The Conference Office will receive special guests from UM Communications today who are returning to help us share some glad tidings. Video producer Fran Walsh, who last year produced four videos for the denomination's website about three of our historic Philadelphia churches--St. George's, Mother African Zoar and Tindley Temple--is coming back for more. This time she's bringing a team to video record interviews with our conference Prison Ministries and Restorative Justice Team and also capture scenes of them sorting through thousands of signed Christmas cards for prison inmates. Fran was looking for a good Advent story to produce while in the Philadelphia area. So we told her all about this timely ministry that delivered to inmates about 5,000 Christmas cards last year, each signed by a caring church member eager to share some Christmas spirit. We're doing the project again this year, hoping to surpass last year's record. And now Fran will be able to share our story and our Christmas spirit with the UMC connection and beyond next month through the www.umc.org website and UMTV. Stay tuned. The Eastern PA Conference Extended Cabinet joined about 750 other United Methodists at a summit for conference leaders last week in Jacksonville, Fla., to focus their attention on cultivating vital congregations. At a time when church controversies leave many feeling troubled with fear and pessimism, the leaders were urged to lead with courage for the sake of the church's future. Kathy Gilbert of UMNS reports on the discussion. Read story. Also read " Church Leaders Kick Off Quadrennium With Vital Congregation Focus," about the summit's celebration of the denomination's global mission focus on cultivating vital congregations to make disciples of Jesus Christ for the transformation of the world. The Nov. 2-4 summit came just as the Council of Bishops announced a special General Conference that probably will be convened in 2019 to discuss the church's policies on homosexuality. Members of the Commission on a Way Forward, who are charged with reviewing those policies, will be meeting throughout 2018 and will send their report to General Conference delegates. Committee on Native American Ministries planted a ceremonial Tree of Peace and taught tribal social dances, in welcoming guests to its twice-yearly worship and fellowship gathering on Sunday, Nov. 6, at Innabah Camp & Retreat Center. Those guests included several local church CoNAM chairpersons who came to learn about Native history and culture, but also Wayne Ghost, a young Albright College freshman from South Dakota, whom the committee aided with travel funds for his journey here. Read the event story and also " The Saga of Wayne Ghost" on our website, and then enjoy photos from this special event on our Flickr page. Also, Bishop Peggy Johnson, who said a prayer during the Innabah gathering, offers a new essay, " For healing and justice, much work is needed!" on her Bishop's Blog for national Native American Heritage Month. She advocates for the Standing Rock Sioux nation in North Dakota trying to protect its water safety and sacred burial sites against a corporation's construction of a crude oil pipeline backed by state officials and law enforcement. "These issues and many more broken treaties and injustices have created a lingering historical trauma in the lives of our First Nation people," she writes. "This is part of the reason that the teen suicide rate among Native Americans between the ages of 15 and 24 is more than double the national average." Finally, be sure to read " Christmas Shoe Box in Montana," about the annual Christmas Shoe Box Mission of the Blackfeet United Methodist Parish. CoNAM urges you to support this worthy mission to provide shoeboxes containing simple Christmas gifts to grateful children on the Blackfeet Reservation in northwest Montana. The Central District Board of Church Location & Building invites anyone and everyone to attend a panel discussion about church transitions this Saturday, Nov. 12, 9:30 AM to 12 noon, at West Lawn UMC in Reading. This seminar is especially for churches wanting to know more about church closings, mergers or sale of property. Please download and share the flyer. Contact the Rev. Mary Jane Kirby at pastor@unionhavertown.org for more information. LUMINA will hold its annual Celebration Dinner on Friday, Nov. 18, at First UMC Lancaster, 6-8 PM. Once again, they will offer a baked potato bar with a variety of meats and veggies as toppings, along with a bounty of desserts, all for free, thanks to the generous LUMINA Board of Directors. However, donations will be appreciated. "This is a great opportunity to visit with men, women, and children who have been blessed by our ministries, or to discuss ideas for new ways of helping struggling families in Lancaster," said Correen Russo, Executive Director. She also invites people interested in serving on the board or learning more about LUMINA's ministry in the Lancaster area to "please come!" E-mail her by Nov. 16 at office@luminaoutreach.org. LUMINA is a collaborative mission project of the Eastern PA Conference and the churches of its Southwest District. See their most recent newsletter. Join St. Matthew's UMC in Reading (501 S 18th St.) for a free concert and Thanksgiving dinner for the community on Saturday, Nov. 19, 5 to 8 PM. Hear dynamic Christian music with Latin rhythms (including congas, piano and guitar) by Surrendered from Lebanon. For more information contact Pastor Rick Wrisley at 610-374-6565 (O) or 267-992-1427 (cell), or call José Albarrán at 717-304-5273. Please download and share the flyer. What's your church or mission connexion planning for Thanksgiving and/or Advent? Please let us know your plans for celebrating Thanksgiving and Advent, so we can list and promote them on a special page we'll create this week on our website. Send your details asap to communications@epaumc.org. Thanks! The Congregational Development Office will hold another Lifetree Cafe Orientation & Training on Mondays, Nov. 21 (part 1) and Dec. 12 (part 2), from 6:30 to 8:00 PM, at the Conference Office. Contact the Rev. Gordon Henderson, Coordinator, at gordonacts6@gmail.com or call him at 267-258-9509 if you wish to attend. Time to "Catch the NEWSpirit!" Our Fall issue is online now. A full report on the Adjourned Session of Annual Conference. Bishop Peggy Johnson's timely, challenging essay: "An Inconvenient Christmas." An update on mission work happening in Africa with our support. Two features on churches investing in local education and using their makeovers to enhance ministry. A vivid photo essay on the changing seasons of our camps and our lives. More racial justice and race relations dialogues. Clergy grads gaining wisdom from the Financial Leadership Academy. And a colorful, multicultural back page you just have to see to believe! Time to subscribe to NEWSpirit? You can certainly enjoy this issue online. But it's a real page-turner, and you'll get the full effect of articles and photos in our colorful print edition coming out next week. If you don't receive NEWSpirit, why not subscribe today? Send just $12 to "EPA Conference Communications ," and mail it to us at P.O. Box 820, Valley Forge, PA 19482-0820. Please write "NEWSpirit" on the memo line of your check . It's here now, and it's coming soon! The digital 2016 Conferenc e Journal is online now. Download the online version from our website. Note: The Agencies , Clergy , Church , and Laity sections are password-protected to respect the privacy and personal contact information of individuals listed in those sections. Use your website directory login access information to unlock these PDF sections. Contact your District Office to receive the new password if you are eligible. The printed 2016 Conference Journal is coming soon. Order now! A limited number of printed 2016 Eastern PA Conference Journals will soon be available. Order yours today for only $30 each. You can order and pay online or send a check, by USPS, to: EPA UMC, Attention Gloria Knoeller, PO Box 820, Valley Forge, PA 19482-0820. What's in the Journal? Contact information for Conference staff, clergy, Camp and Retreat Centers, Districts, and United Methodist Boards and Agencies. Also, clergy appointments, pastoral salaries and service records. Plus, all about the 2016 Annual Conference; Conference statistics for 2015; historical highlights; and conference policies and procedures for clergy, staff, and others. Questions? Please contact Gloria Knoeller at gknoeller@epaumc.org. The Eastern PA Conference Health & Healing Council offers its new issue of Wellspring, a bright, easy-to-read but hard-to-put-down newsletter to help you become smarter and more spiritual about your health. Read about Global Ministries' 10,000 Church Challenge to spread health awareness and also cardiac emergency training for church members. Get Children's Book Corner tips on promoting kids' health and more tips on getting pregnancy and motherhood advice from texting services. Find creative ways to fit walking into your daily routines, or to use a scooter when walking is too challenging. Also, enjoy a recipe and health tips for using slow cookers. Download and read Wellspring Issue 4, November-December 2016 today and then share the wealth of its health wisdom with others. And if you have any ideas for future articles, please let the Health & Healing Council know. They would love to get your suggestions. The United Methodist Volunteers in Mission Northeastern Jurisdiction (UMVIM-NEJ) is looking for young adults to join in a Journey to Cuba next spring, March 3-12, 2017. Adults ages 18 to 30ish are urged to apply. You'll be trained to become UMVIM Team Leaders during the trip and be equipped to lead mission work teams in the future. Only 10 applicants will be selected, but act now. The deadline for applications is Nov. 25. The Methodist Church in Cuba has more than 42,000 members and a worshiping community of 65,000. It is vibrant and growing, especially among young people. We will travel on religious visas by invitation of the Methodist Bishop of Cuba and spend most of our time in Havana at the Seminario Evangelico Methodista (Methodist Evangelical Seminary). We'll witness the revival taking place in the church there and worship with our Cuban friends. We'll also bring supplies and work alongside them to help build housing for the seminary. All levels of skill and experience are welcome. Please share this information with pastors and young adults whom you think could make good mission team leaders. Read and share the flyers for more information including costs for the trip. Leading the trip will be UMVIM-NEJ Coordinator Tom Lank and Nechi Fullerton, leader of 8 VIM teams to Cuba. Deadline for applications is Nov. 25. Questions? Visit the UMVIM-NEJ website or contact the Rev. Tom Lank , UMVIM-NEJ Coordinator, at 919-428-0461. All clergy and ministry candidates are encouraged to attend a Social Entrepreneurship & Economic Development half-day seminar on Wednesday, Nov. 16, from 8:30 AM to 1 PM, at Innabah Camp & Retreat Center (712 Pughtown Road, Spring City). Then attendees should stay for hour-long retreat meetings of the Order of Elders, Order of Deacons and Local Pastors Fellowship, at 1-2 PM. The seminar registration fee, which includes a buffet breakfast and hot lunch, is $20 until Oct. 15 and $25 after Oct. 15. The seminar is sponsored by the Southeast District. Register online now. "Social entrepreneurship is a form of entrepreneurship that integrates social goals and social problem-solving into the core business model," explains our presenter, Dr. Jeffrey A. Robinson, Ph.D. He is Academic Director of the Center for Urban Entrepreneurship & Economic Development, a Rutgers University Associate Professor of Management & Global Business, and Director of Rutgers' Business School and its New Jersey Social Innovation Institute. As challenging as 2016 has been, 2017 may prove to be even more so, as we embark on new, unpredictable four-year journeys for both our church and our nation. In both arenas, we are a people in conflict, encountering doubt, discord, disruption and division. But we are also a people of faith, who lean heavily on the steadfast promises of God. So it is in our constant prayers and our confident praise that together we can seek and find unity, loving harmony and the blessed assurance of all things hoped for in God. The United Methodist Council of Bishops' Commission on the Way Forward has asked each annual conference to take turns praying vigilantly for one week. The Eastern Pennsylvania Conference will pray together during the week of January 8-14, 2017. Pen-Del Youth Rally 2017: "This Is Love"
The theme is "This Is Love" from 1 John 4:10. Featured guests will be motivational speaker and "champion for youth" Steve Fitzhugh, along with Rend Collective, Zealand Worship Band, Dave & Brian, and a full concert by gospel singer Tasha Cobbs. Calling all talented youth...again! Don't miss the next FOHS gathering Friday, Jan. 20, 7 PM, at New Birth UMC, Lebanon. Come for a fun-filled, high-energy night of young talent with uplifting, celebrative music in English and Spanish, plus dance and spoken words of wisdom! Also, enjoy dinner after the program. This is a Christian youth event, but you do not have to belong to a church to attend. Come one and all to share your talents with the Lord, or just come and enjoy this spirit-filled celebration of life and faith. Spread the word! Restoration 2017: "Prayer, Praise and Presence"
The Restoration 2017 Retreat is Bishop Peggy Johnson's invitation to clergy and lay members of the Eastern PA and Peninsula-Delaware conferences, to gather in retreat January 26-28, at the Sands Hotel in Rehoboth Beach, Del. The theme is "Prayer, Praise and Presence." The purpose: "Finding new life in the spiritual disciplines to bring strength to our Christian journey." This event replaces the former Mid-Winter Retreat for Clergy and Spouses that had drawn fewer participants over the past several years. The focus of this Restoration retreat is to bring to light aspects of ministry, life, and community that need to be restored within us on our journey of making disciples. Our guest speaker will be the Rev. Junius Dotson, the new General Secretary of UM Discipleship Ministries. All are invited to join in this gathering to pray, praise and worship God in the presence of our Lord, Jesus Christ. Worship will begin the retreat Thursday evening and end it Saturday morning. In-between there will be ample time for prayer and personal reflection, workshops, fellowship and meals together, and even laughter inspired by a guest comedian. Two (2) CEUs will be granted for attendance. Online registration will be available once all the program details are finalized. With October being Clergy Appreciation Month, Bishop Johnson is asking churches to consider showing appreciation and care for pastors and their families by gifting the cost of their registration for Restoration. Our 2017 annual Faith-Sharing Training Event will happen March 18, from 8:30 AM to 2 PM, at New Hanover UMC. Our guest presenter is the Rev. Terry Teykel, a leading "prayer evangelist" and popular speaker and author. He travels the world encouraging churches to develop and strengthen prayer ministries as a means of revival and transformation. Teykel, the founder of Renewal Ministries and Prayer Point Press, has authored several books, including The Presence-Based Church, My Most Wanted: 40 Days to Pray for the Lost, and Pray the Price: United Methodists United in Prayer. He has spent his life teaching churches how to develop a heartfelt, meaningful relationship with the Lord. His warm, humorous style makes him a much-sought after speaker and seminar leader. "We believe that when prayer and evangelism are reunited the Church will emerge as a powerful force for reclaiming the land and setting the captives free." -Terry Teykl. Learn more about this passionate, powerful speaker and man of God. And on Tuesday, Feb. 28, the day before Ash Wednesday, clergy across the conference will gather at locations in their respective districts for a Clergy Lenten Day Apart. They will pray, worship and fellowship together in preparation for the beginning of the Holy season of Lent. 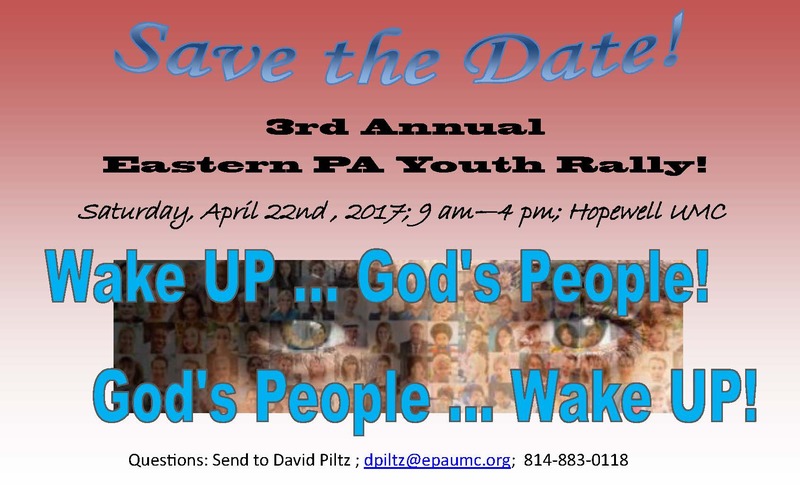 April 22: Eastern PA Conference Youth Rally. 9 AM to 4 PM at Hopewell UMC, Downington, PA. Theme: "Wake Up, God's People! God's People, Wake Up!" April 23-25 - Local Pastors and Associate Members Retreat. At Black Rock Retreat Center, Quarryville, PA. Theme: "The Authority of Scripture." April 29: Tools for Ministry (possibly including classes on prayer, worship and other spiritual disciplines). Times and locations determined by districts. Christ UMC Fairless Hills will host a 90-minute Legacy and Planned Giving Workshop, Saturday, Nov. 12, 10-11:30 AM. J ack Brooks, CEO of the Mid-Atlantic UM Foundation, will share tools, techniques, and materials about this important aspect of Christian stewardship. Attendees will receive a copy of the book Provide and Protect, along with other resources, case studies and answers to important financial questions. There is no cost for the workshop, but registration is required. Call Christ UMC at 215-943-2343, or email: Christunitedmethodist@comcast.net. Download and share the event flyer. And for the trifecta of upcoming youth events, plan to attend the 3rd Annual Eastern PA Conference Youth Rally on Saturday, April 22, 2017. For the first time, this youth rally will last all day, from 9 AM to 4 PM. We're planning fantastic features, with dynamic speakers, soul-stirring music, fun games, powerful prayers, laugh-out-loud humor, great food and hospitality, and enough friendship and fellowship moments to give you a lifetime of memories. Don't dare miss it! See and share the flyer, and look for more details, coming soon.